Last week’s post profiled a former Whistlerite who came to this valley with dreams of resort development, so I figured I’d switch it up this week and recount the story of a local figure who came here with very different intentions, to escape from the stresses of modernity into a quiet life of mountain-bound solitude. William “Mac” MacDermott was born somewhere in the American Midwest in 1869 or 1870. We know little of his early life, but his experiences as a soldier during World War 1 eventually led him to the Canadian wilderness. Mac suffered severe injuries while fighting (some Alta Lake contemporaries mentioned that he also suffered from shell shock) and he left the army disillusioned with the senseless violence of modern civilization. 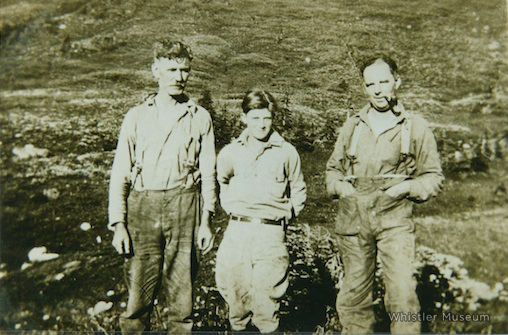 Mac (left) with local guest-lodge owner Russ Jordan and a boy (possibly Russ’s son) near Singing Pass, 1920s. After the war he spent a brief stint prospecting for gold in the Cariboo before heading back down the PGE railway to Alta Lake, where he settled in 1919. The tranquility of this quiet mountain valley was perfectly suited to his gentle demeanor; Mac made Alta Lake his home for the next 25 years. He built a handful of log cabins at the south end of Alta Lake, one for himself, the others he operated as rental properties during the summer months. I guess, in a sense, Mac was a real estate developer too. Vancouver’s Matheson family spent two months at Mac’s cabins every summer from 1927 until 1934. Betty Jane Warner (née Matheson) was just a young girl during this period, but in correspondence with the Whistler Museum from June of 2011, she vividly recalled those action-packed summer getaways. We children thought [Mac] was wonderful, truly a favourite of ours and we would visit him often in his cabin. He played the juice harp, smoked a lot, was a great spitter, swore and turned his flapjacks by tossing them sky-high, hitting the ceiling and miraculously catching them back in the pan. A marvellous feat… He was a great hiker and would take [Matheson siblings] Jack, Claudia and me on many treks to Lost Lake and Green Lake. We would pick him up at the Abbotsford Hotel on Pender Street… He would always present each of we three children with one green dollar. There was no better gift or more welcome guest around our festive table than to have Mac join us for Christmas Day. 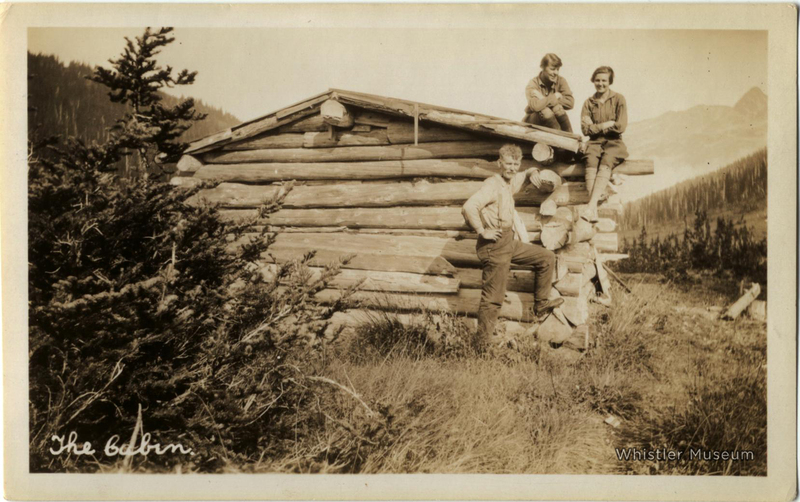 While beloved by children, other Alta Lake locals recall Mac’s cabin as a preferred spot for some of the men to “get away from the wives” for a few hours. On one occasion, Some of Alex Philip’s Vancouver friends were having such a good evening that they didn’t want to get back on the train to head back to the city, even though they had to work the next day. Knowing the PGE wouldn’t let them on the train soaking wet, the two men accidentally “fell” into the lake. Now stuck at Alta Lake, the men had no choice but to return to the party. Ice-cutting day was an Alta Lake February tradition (ice blocks were cut out of the lake ice to provide refrigeration in insulated through the summer months), and after the work Alta Lake staples like Alex Philip and Bert Harrop would come over to enjoy some of Mac’s popular homebrews. Aside from managing his cabins, Mac supported his simple mountain lifestyle with a variety of casual jobs; carpentry, building rowboats, and trapping, but it as a guide for work crews and hikers heading up into the mountains that he is best remembered. 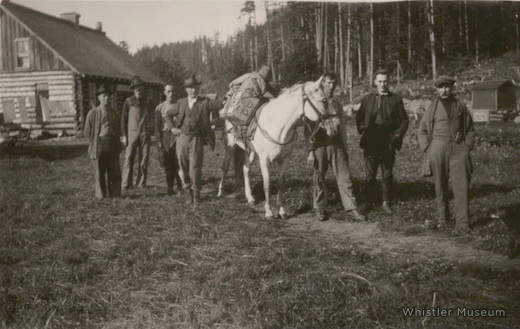 Mac (2nd from left) with a crew of men helping Jimmy Fitzsimmons set up a load of dynamite to be hauled up to Fitzsimmons’ copper mine on the north flank of Whistler Mountain, circa 1919. The creek that they followed to get to the mine is known today as Fitzsimmons Creek, which runs along the edge of Whistler Village and provides the hydro-electricity for Whistler-Blackcomb mountain operations. Mac’s favourite destination was up the Fitzsimmons Valley along the Singing Pass Trail. In the sub-alpine meadows there was an old trappers’ cabin maintained by Mac and fellow Alta Lake mountain man Billy Bailiff, which they used on overnight hikes towards the larger peaks at the back of the Fitzsimmons Range. In the Whistler Archives we have a great collection of photos from a 1928 hike that Mac took with Myrtle Philip, and two of her young staff from Rainbow Lodge, Lena Hanson and Mollie Stephenson. 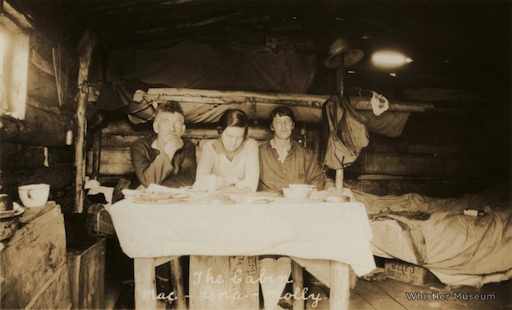 Mac with Lena Hanson and Mollie Stephenson at the Singing Pass trapper’s cabin (photo by Myrtle Philip), 1928. The Seventh Heaven ski area and Blackcomb Peak are visible at far right background. After spending a night at the cabin, they headed up over Cowboy Ridge to Fissile (then known as Red Mountain). 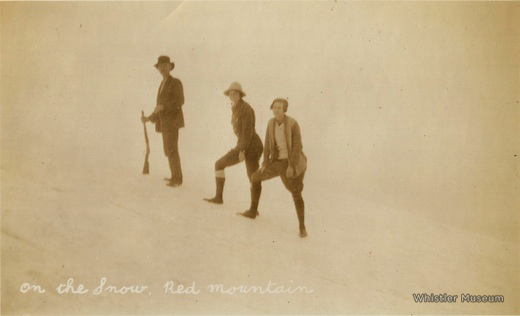 Mac and the girls snow-climbing on the flanks of Fissile Mountain, during the same 1928 hike. This was exactly the life that Mac had envisioned when he first escaped to this remote Canadian outpost. He stayed on at Alta Lake until his death in 1946 at the age of 76. This entry was posted in Characters, Environment, Pioneers, Recreation. Bookmark the permalink.